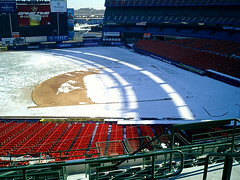 MetsGrrl.com is the home for the baseball musings and photography of your charming hostess, Caryn Rose. Caryn Rose is a Brooklyn-based writer and photographer who documents New York City, rock and roll, and Major League Baseball. 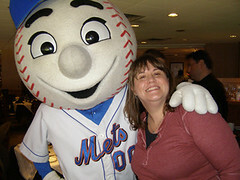 From 2006-2011, she authored the groundbreaking blog metsgrrl.com, covering baseball and the New York Mets. Her first novel, B-sides and Broken Hearts, was published in 2011, followed by the non-fiction work Raise Your Hand: Adventures of an American Springsteen Fan In Europe in September of 2012. In 2014, she released her second novel, A Brand New Ballgame. You can find her at jukeboxgraduate.com and on Twitter at @carynrose and at @metsgrrl during the season. She believes bunting is for losers, hates the designated hitter, and thinks you should never walk the pitcher. This site started as a private Blogger blog back in the Spring of 2006, when I had just laid money down for a Tuesday-Friday plan at Shea, and wanted to keep a diary about my first real year as a baseball fan. At the time I knew very little about baseball, and had taken the step of purchasing a plan (as opposed to just going to games whenever) because I wanted to make sure that my Mets-fan-from-birth boyfriend (referred to on this site as TBF) had some kind of priority in the new Mets stadium. I had started going to games regularly during the 2005 season, and liked it pretty good, so I figured, hey, why not? At some point during the spring of 06, some of the sites on my blogroll noticed hits coming to their site from mine, and they came over to take a look around. To my complete and utter surprise, they liked what I was doing, and started telling their friends. By the end of the year, I had been interviewed for Mets Weekly, had gone to my first road game, started photographing baseball, and had to figure out how to move the blog off Blogger because it wasn’t my little private project any more. This is the last thing I ever thought I would be doing. My family are not baseball fans. My father, who was born in Flatbush, is one of those guys who stopped following baseball when the Dodgers left Brooklyn. He used to cut Hebrew School to go to Ebbets Field. (I never knew any of these things until very recently.) Like everyone in Seattle (where I lived for 9 years), I sort of jumped on the Mariners bandwagon in 1995 and went to a handful of games a year. I had plenty of baseball-loving friends, but no team of my own until 2005. This site is called “MetsGrrl” because I’m a cranky punk rock feminist. (The ‘grrl’ part comes from the Riot Grrl movement.) I wanted people to know right away that this site was written by a woman, but I also wanted to make sure I wasn’t mistaken for one of those girls in the pink hats that screams every time David Wright brushes dirt off of his uniform. I write from a feminist viewpoint, and yes, I favor baseball blogs written by women in my blogrolls and will do so until we have more of a majority. Deal with it. I’m not a historian or a statistician, and although I have learned a tremendous amount since I started this site, I am completely transparent about what I do and don’t know. If you came here looking for a statistical argument, however, you’re in the wrong place, and there are plenty of fantastic sites that do that. The beautiful thing about the internet is that if you don’t like it, you can start your own, or read one of the dozens of other fantastic Mets blogs that are out there. In other words: If you think this is the an official Mets web site, you need help. Don’t take the stuff that’s on here, especially without asking. Play nicely with the other children.